The Summer School will take place in Linköping University. 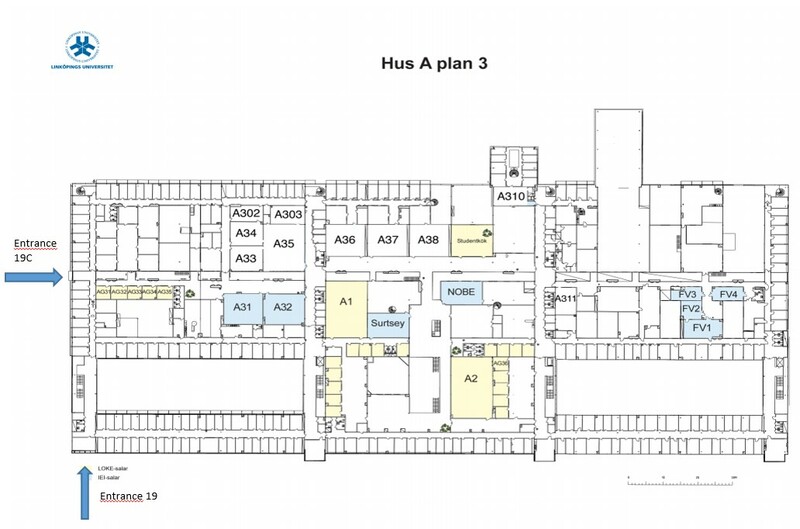 The Introductory course is to held at C-Hus and Main courses at A-Hus. Following rooms have been booked for the summer school. 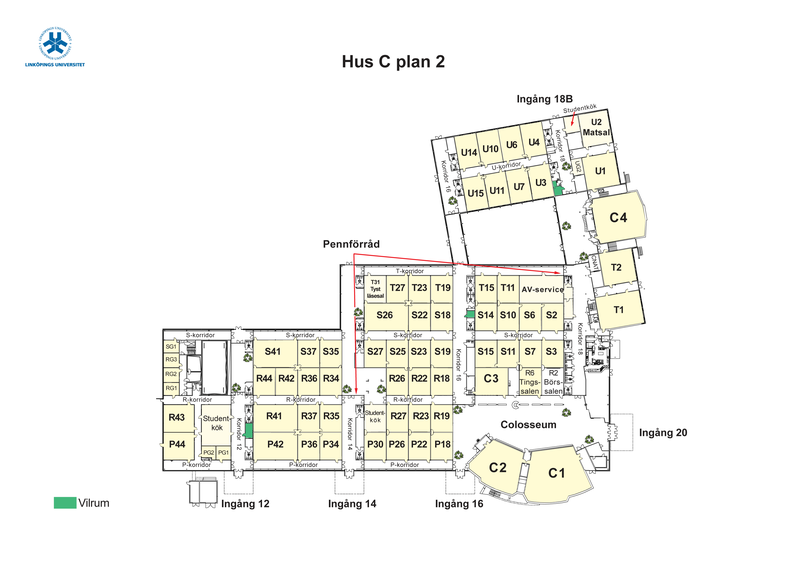 Participants from the Introductory course can enter C-Hus from either Entrance 20 (Ingång 20) or Entrance 16(Ingång 16) to meet up at Colosseum during the registration period. To reach for the Main course rooms, enter the building either from Entrance 19 or 19C. Take the staircase upwards for plan 3 and follow the location as shown in the map below. It is quite easy to travel to Linköping and there are several ways (http://www.visitlinkoping.se/en/travel). Once you get to Linköpings Centralstation you can take a taxi or take a bus in Linköpings Resecentrum. You can find more information about the ticket and public transportation in https://www.ostgotatrafiken.se/. Linköping has an international airport, Linköping City Airport (http://www.linkopingcityairport.se/en/), with everyday flights from and to Amsterdam and Copenhagen, with KLM and SAS, respectively. The easiest way to go from the Linköping Airport to the city centre is by taxi. Another option can be to fly to Copenhagen (https://www.cph.dk/en/) and to take a train from Copenhagen Airport to Linköpings Centralstation. While you are in Linköping the best way to move around is by bus. The city has an extensive bus network (https://www.ostgotatrafiken.se/globalassets/media/filer/kartor/tatort/2015/ot_linkoping_locked_151007.pdf). To get to the University (http://www.liu.se/om-liu/till-liu/kartor/campus-valla/1.644235/LiU_Valla_150812.pdf) there are some lines 2, 4, 12 and 20 (https://www.ostgotatrafiken.se/print4web/Samlingstabell/151213_160619/Samlingstabell_202-204-212-220_151213_160619.pdf). You can buy a travel card in the sales agents (https://www.ostgotatrafiken.se/Priser–biljetter/Kopa-biljett/Forsaljningsombud/Linkoping/) and then load it. It is also possible to buy a season ticket, with a chosen period of time and area. Or, if you prefer, you can rent a bicycle and enjoy the swedish lifestyle!